Thanks again to everyone who participated in our survey earlier this year! Included in this blog are the results of that survey and information about the GLPC as a whole. Your feedback has been crucial in helping us plan for a 2016 filled with new information and the resources you requested.Thanks for another great year and, as always, please send your questions, comments or suggestions to phragmites@glc.org. 99% of survey participants found the GLPC valuable, with 91% ranking it as a 1 or 2 on a scale of 1-4 (with 1 being very valuable). 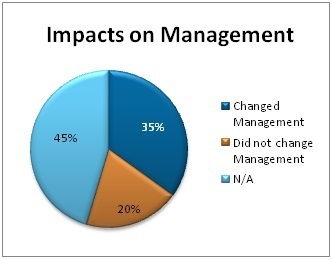 Additionally, 35% of participants changed their management based on the GLPC. When those who did not find the question applicable are removed from the data, 64% of participants changed how they manage non-native phragmites. 43% of participants found management tools to be the most useful portion of the existing website, this matches closely with the results that showed participants were most interested in information about management. The GLPC website was visited by approximately 11,000 users in 2015. 75% of those users were from the United States and 13% were Canadian. Additionally, data from the GLPC website shows that users accessed native vs. non native information, basics, the biomass utilization blog and webinars most. Survey participants were almost equally interested all of the new tool options provided. As a result of this survey, and feedback received throughout the year, the GLPC is working on a variety of new resources and materials for 2016. Watch for more resources personalized for specific groups (such as Canadian users and private land owners), template materials, and case studies that highlight successes around our region and provide valuable lessons for everyone involved with Phragmites management.